DA to Mom of Teen Shot by Stockton Police: "We Failed You." Our General Membership Meetings are not only an opportunity to hear updates on projects that the committees are working on, but also an opportunity for members to discuss any community concerns. Guest speakers generally grace our membership meetings every month that extend to law enforcement, city officials, and other local organizations. It is highly encouraged that members participate and let their voices be heard. At their February 22nd meeting, the SJCOG Board awarded a total of $19.63 million of competitive funding from the Measure K Bicycle, Pedestrian, and Safe Routes to School Program and the Measure K Smart Growth Incentive Program to 21 projects and plans. Seven months ago, an off-duty sheriff’s deputy shot and killed a young Stockton man he said was threatening him with a gun in an apartment complex parking lot. This week, authorities finally released the identity of the deputy, Michael Knight, who joined the San Joaquin County Sheriff’s Office three years prior to the fatal shooting. His name was provided by the Stockton Police Department, the lead investigating agency. The man Knight killed was Keenan “Peppy” Bradley, 21, a Stockton native and 2014 graduate of one.Charter High School who was working as a security guard at Amazon in Tracy at the time of his death Nov. 1. Stockton city, county and community leaders gathered at the 2017 State of the City to hear the city’s goals and accomplishments since electing its new Mayor Michael Tubbs. Public safety, the economy and education were the focus of this year’s Stockton State of the City address. Ambitious and excited, newly elected Stockton Mayor Michael Tubbs wants the next four years to be a time of change. “The future of Stockton looks like us so, however hard we are willing to work and collaborate and problem-solving that’s the future of this community and I’m confident at least with the people I work with the people are really trying to move forward,” he said. 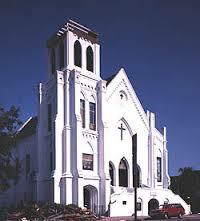 WASHINGTON (NNPA) – When President Obama returns to Emanuel A.M.E. Church in Charleston, S.C. Friday to eulogize Rev. Clementa Pinckney, it will cap a period in which he has become increasingly outspoken on race, even uttering the N-word to make a point about the slow pace of progress in race relations. He quoted Dr. Martin Luther King, Jr. following the 1963 bombing of 16th Street Baptist Church in Birmingham, Ala.
LORETTA LYNCH CONFIRMED TO BE THE NEXT ATTORNEY GENERAL OF THE U.S.
On April 23, 2015, the United States Senate voted, by a margin of 56 yeas to 43 nays, to confirm Loretta Lynch to be the next Attorney General of the United States. This vote came after a delay of more than 170 days; only 2 U.S. Attorneys General in history saw longer confirmation delays. On November 8, 2014, President Barack Obama nominated Loretta Lynch to replace Eric Holder as U.S. Attorney General. Mr. Holder had announced his retirement in September, 2014. Prior to serving as U.S. Attorney General, Ms. Lynch, served as the U.S. Attorney for the Eastern District of New York. Even her detractors admit that she is extremely qualified, and she makes history as the first African-American woman to serve in the position. STOCKTON — With Maya Angelou's stature, persona and brilliance, there probably wasn't much in her life that could be chalked up to coincidence. 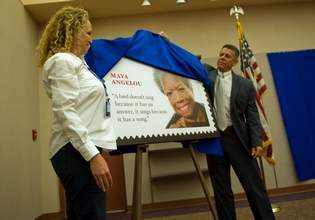 But here's one: A forever stamp was dedicated to one of America's most-noted poets this week, and she grew up in an Arkansas town named ... Stamps. An unveiling ceremony was held earlier this week in Washington, D.C., with such luminaries as Oprah Winfrey and Andrew Young attending. This is the way it often begins. A police officer stops an African-American man who has been tagged as a suspect. By the end of the encounter, the unarmed “suspect” is dead and a debate begins as to why it happened. This time it was 50-year-old Walter Scott in North Charleston, S.C., stopped for a busted tail light, then shot from behind as he fled. We know it happened because there was videotape. Just like there was when alleged cigarette peddler Eric Garner was choked to death by police in Staten Island, or when an officer fatally shot 12-year-old Tamir Rice who was playing with a toy gun in a Cleveland park. There were over 200 cameras at an Ohio Walmart where police shot and killed John Crawford Jr. after he picked up a BB gun. POLICE SHOOT MAN IN THE BACK: WHO WAS WALTER SCOTT? (CNN)The world learned his name after he was killed by a South Carolina police officer. But in his life, 50-year-old Walter Scott was also the father of four children and served in the Coast Guard, his brother said. "He was outgoing -- loved everybody, (was) very known in the community and got along with everybody," brother Anthony Scott told CNN's Don Lemon. "All the family loves him, and his kids loved him."